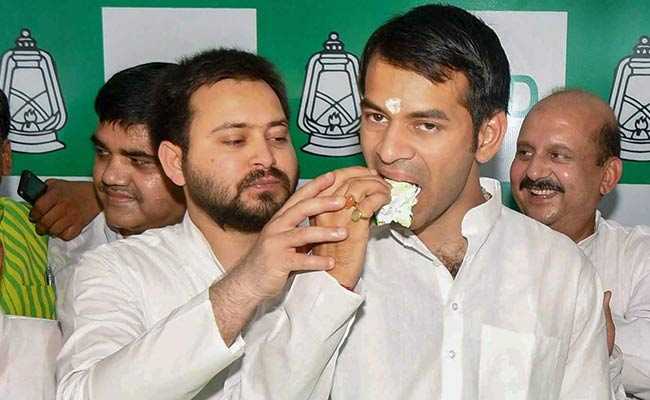 Tejashwi Yadav and his older brother Tej Pratap Yadav cut the cake together as they celebrated their father Lalu Yadav's 71st birthday today, seizing the chance to project sibling unity amid speculation of a rift. 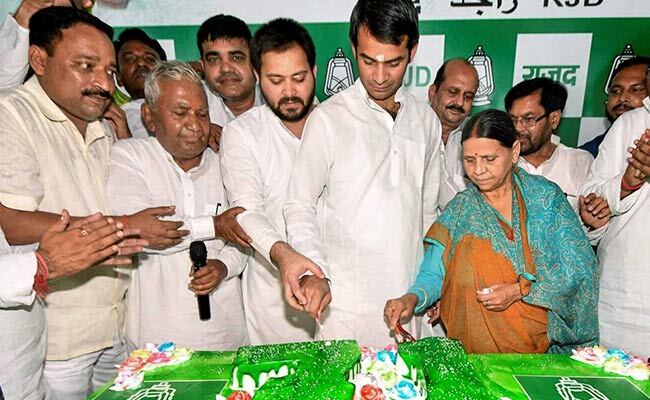 The cake was bright green to depict the colour of the Rashtriya Janata Dal (RJD) headed by Lalu Yadav. Since he was jailed for corruption last year, Tejashwi Yadav, the younger of his two sons, has taken charge of the party and the role of opposition leader. Lalu Yadav, who is out on bail on medical grounds and cannot be seen in public, watched the party at Tejashwi's home on TV, from his own home just a few buildings away. He had, for company, party lawmaker Chandrika Roy, who recently became his in-law. He even sent bouquets that came for him across to Tejashwi's. Lalu Yadav will travel to Mumbai for his fistula surgery soon. His bitter rival, Bihar Chief Minister Nitish Kumar, was among the first to send birthday wishes on Twitter. "Also wish for his speedy recovery," posted Nitish Kumar, who dumped Lalu Yadav last year and revived his ties with the BJP, saying it would be impossible for him to continue with the RJD and Congress because of corruption charges against Tejashwi Yadav, then his deputy. Lalu Yadav watched the birthday party taking place at Tejashwi's home, from his own home just a few buildings away. 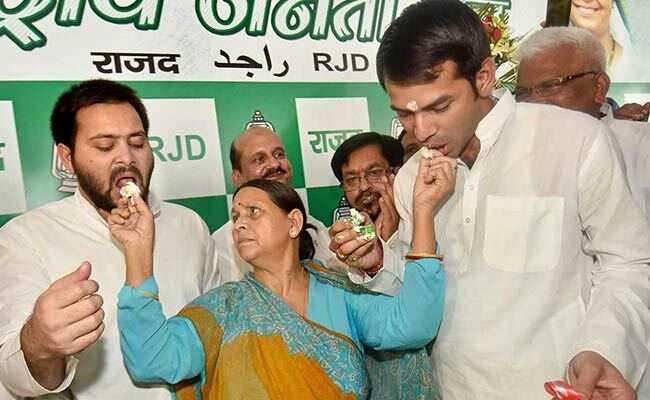 The brothers Yadav held the knife jointly as they sliced the cake, their mother Rabri Devi standing alongside. Tej Pratap and Tejashwi both reiterated to reporters that the party was united and there were no differences between them. Tej Pratap left many wondering with a tweet on Sunday that telegraphed a rift between him and his brother. In the tweet, he said his desire was to "get Arjuna seated on the throne of Hastinapur and himself return to Dwarka (like Lord Krishna)". It was seen to hint at exiting politics while Tejashwi rose to the top as his father's chosen heir. Later, he appeared before reporters and denied any rift, saying "there is a threat to the party" from some insiders and describing Tejashwi as his "Kaleje ka tukda (apple of my eye)." "They are anti-social elements who are destroying the party by furthering their own agenda invoking the name of my parents, Tejashwi, Misa (eldest sister and Rajya Sabha MP) and me," he said. Tejashwi, on his part, called Tej Pratap his "brother and guide".